PHILLIES COACH DUSTY WATHAN ON RANGERS RADAR FOR BIG JOB! 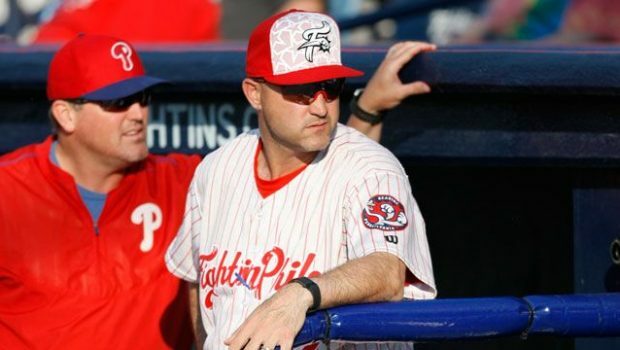 Phillies third base coach Dusty Wathan is looking to move on. The Texas Rangers will interview the 45-year-old Wathan for their manager opening later this week, according to Jim Salisbury of NBC Sports Philly. Wathan, a finalist for the Phillies’ job that went to Gabe Kapler a year ago, is a former catcher who played professionally for 14 seasons and appeared in the majors with Kansas City in 2002. He managed 10 seasons in the Phillies’ minor-league system and was Eastern League manager of the year at Double A Reading in 2015 and 2016 before moving up to Triple A Lehigh Valley in 2017 and joining the big-league staff under Kapler in 2018. He managed many of the players that have recently arrived in the majors with the Phillies. The Rangers fired manager Jeff Banister in late September. Previous VEGAS: TEMPLE 3 1/2 OVER CINCY, PENN STATE 14 1/2 AT INDY! Next THE IMPORTANCE OF BEING FLETCHER COX, EAGLES DEFENSIVE ROCK!